their store of poop they hide it away. 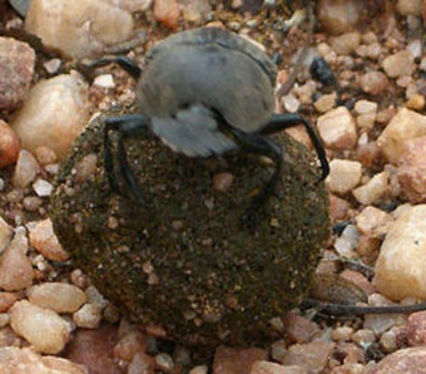 Researchers have found that, in their quest to keep their precious dung from competitors, the dung beetles use the stars to navigate their way. By using the stars they are able to move in straight lines rather than going in circles. Scientists were led to the hypothesis when they noticed the beetle's ability to find its way even on a moonless night. In field experiments in South Africa they discovered that the bugs were not able to maintain their direction when the skies were overcast. To further test their hypothesis, the researchers set up an arena three feet tall to block out all landmarks and put the beetles through their routine. The insects were tested under starry skies to test their regular activity. Then they were fitted with tiny cardboard helmets to block their view of the sky and set through their paces again. Without a view of the stars it took them significantly longer to roll a ball of dung and get it to the edge of the arena. Without the stars they seemed confused and would wander aimlessly. This experiment was also repeated inside a planetarium in Johannesburg with much the same results. The beetles also use the sun and moon for directional orientation. These findings may lead to the discovery that more of the animal kingdom uses the stars to find their way through life than was previously thought.